Does the United States have the right to defend itself by striking first, or must it wait until an attack is in progress? Is the Bush Doctrine of aggressive preventive action a justified and legal recourse against threats posed by terrorists and rogue states? Tackling one of the most controversial policy issues of the post-September 11 world, Michael Doyle argues that neither the Bush Doctrine nor customary international law is capable of adequately responding to the pressing security threats of our times. In Striking First, Doyle shows how the Bush Doctrine has consistently disregarded a vital distinction in international law between acts of preemption in the face of imminent threats and those of prevention in the face of the growing offensive capability of an enemy. Taking a close look at the Iraq war, the 1998 attack against al Qaeda in Afghanistan, and the Cuban Missile Crisis, among other conflicts, he contends that international law must rely more completely on United Nations Charter procedures and develop clearer standards for dealing with lethal but not immediate threats. After explaining how the UN can again play an important role in enforcing international law and strengthening international guidelines for responding to threats, he describes the rare circumstances when unilateral action is indeed necessary. 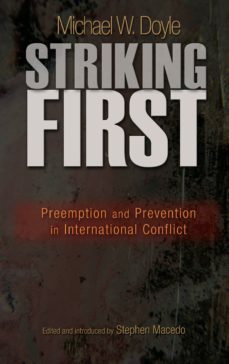 Based on the 2006 Tanner Lectures at Princeton University, Striking First includes responses by distinguished political theorists Richard Tuck and Jeffrey McMahan and international law scholar Harold Koh, yielding a lively debate that will redefine how--and for what reasons--tomorrows wars are fought.